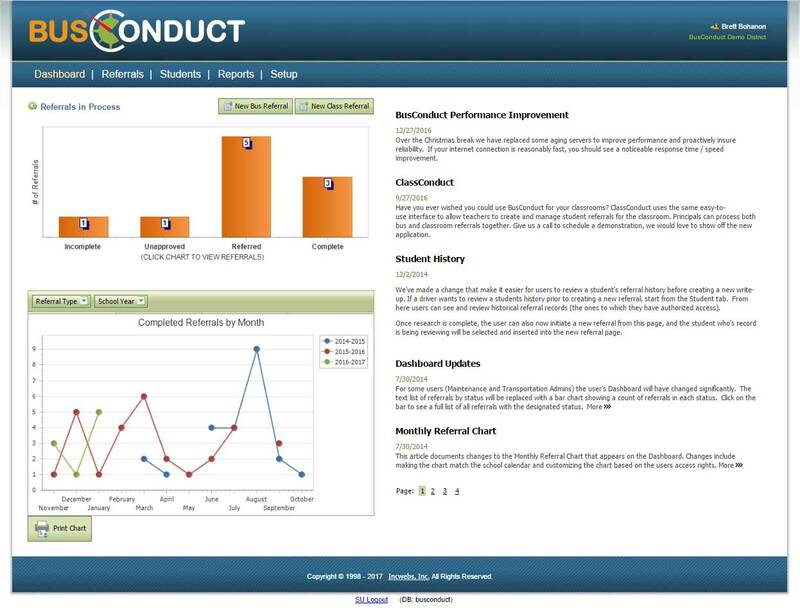 The dashboard provides an overview of tasks and where they are in the overall referral process; incomplete, unapproved, referred, complete and archived. Each referral moves through these five states as information is added. The view varies by user type to provide the data approprite for each user. Creating a new bus referral is quick and easly often requiring less than a minute to fully and accurately document a problem or event. Like in accounting systems, the Aging Report is a tool for monitoring and taking action on referrals that are not receiving the attention they deserve quickly enough. 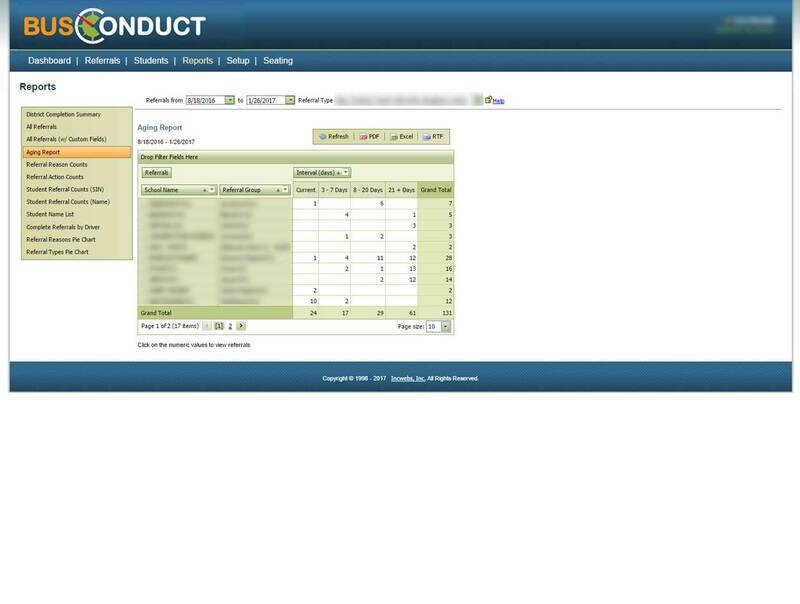 Clicking on a number within the aging report allows reminders to be sent to the appropriate school administrations quickly and efficiently. 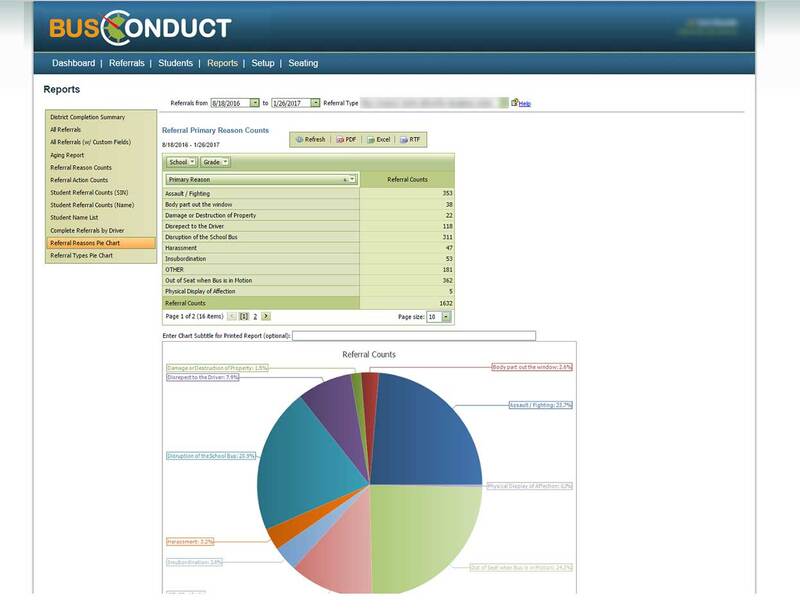 The referral reason pie chart provides districts with a graphical representation of the various referrals reasons with a given referral type. The report can be limited to specific schools or grades to provide additional insight into the types of things most commonly happening for different groups of students. The district completion summmary displays responce times and rates for each school within the district for each referral type. The Referral Completion Summary is a good tool for monitoring and managing individual school response rates to bus referrals. 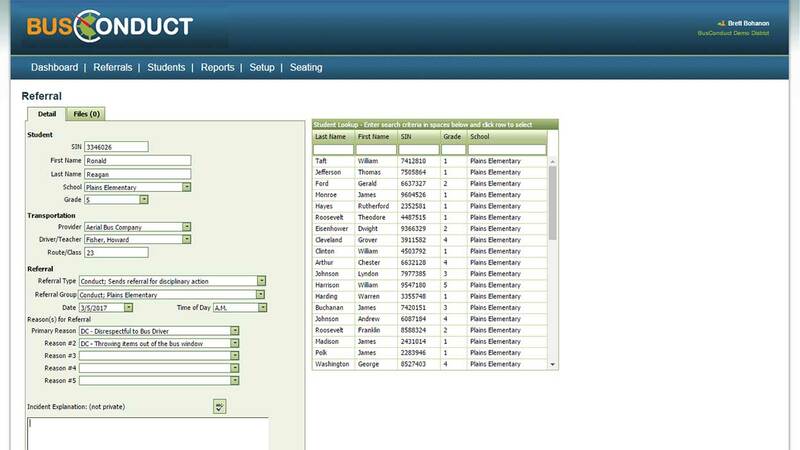 District managed referral action lists allows districts the capability to maintain custom followup action plans. 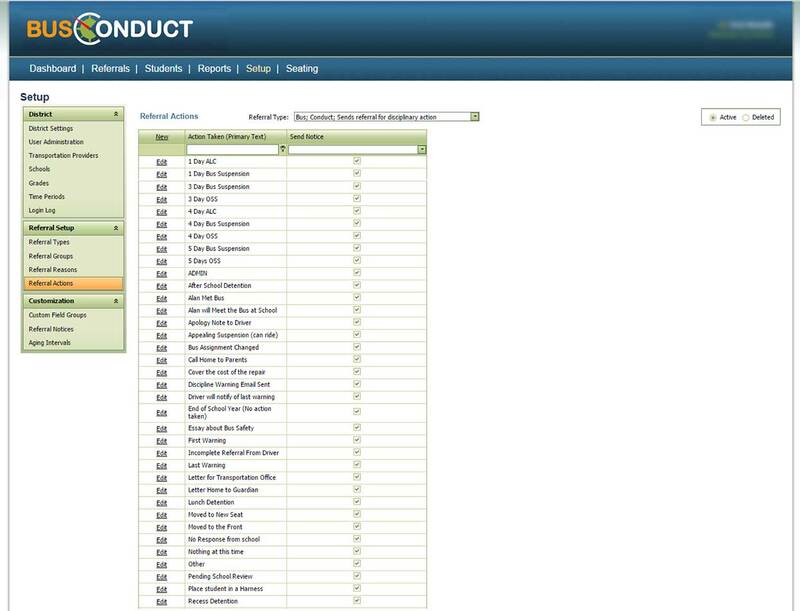 A different referral action list is maintained for each referral type, so for example a district may have a different followup strategy for conduct referrals for special needs students. District managed referral reasons lists provides custom referral reason capabilities for each district. A unique list is maintained for each referral type. 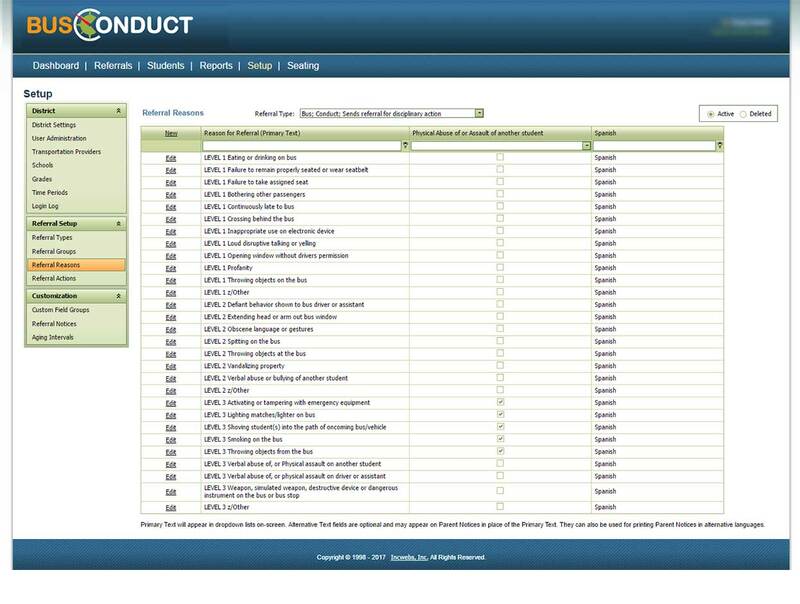 Typical referral types include Classroom Conduct and Classroom Incident (for tracking non discipline items).